The Dollar Tree. The place that ever single item is only 1 DOLLAR, and we spend more on items that we truly don’t need, but hey- it’s just $1! Are you with me on that?? Well, lately the Dollar Tree has been one of my absolute favorite places for some pretty dang awesome DIY projects! 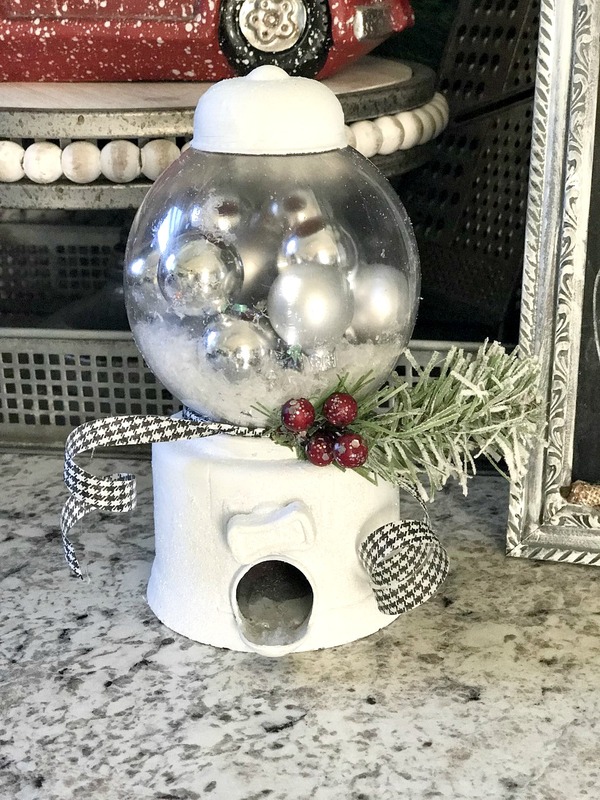 I have done several Facebook lives lately that have shown my readers some great ways to turn little dollar items into awesome Christmas/home decor! It feels like the more I do, the more imaginative I get each time I do in there. Well, the other day, I was wandering the aisles, making sure there was nothing I “needed”, and I spotted these little cute gumball machines. As soon as I saw them, I knew what I wanted to do with them! I took it apart (SUPER EASY)! 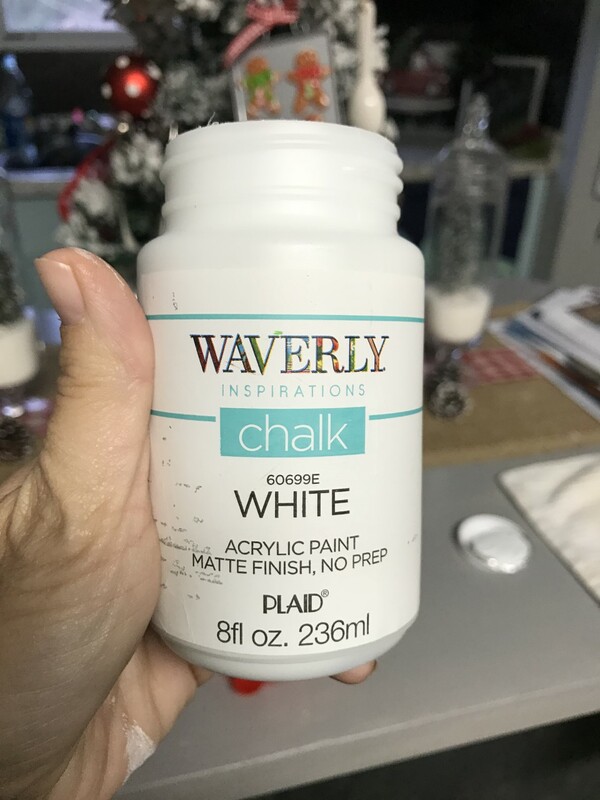 I then grabbed some paint I had on hand (Any kind will do, I am sure…but I had this white chalk paint), and I painted all of the RED part white. 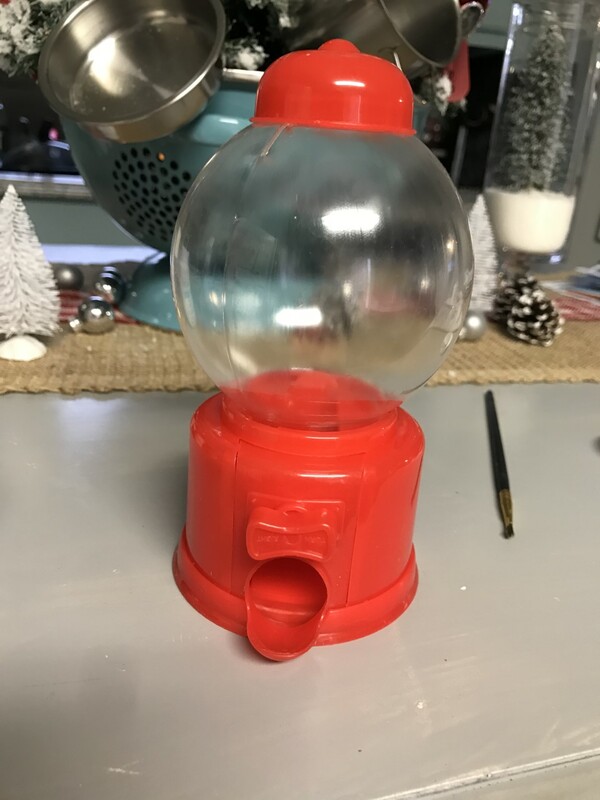 When that had dried, I put the gumball machine back together, with the exception of the top. 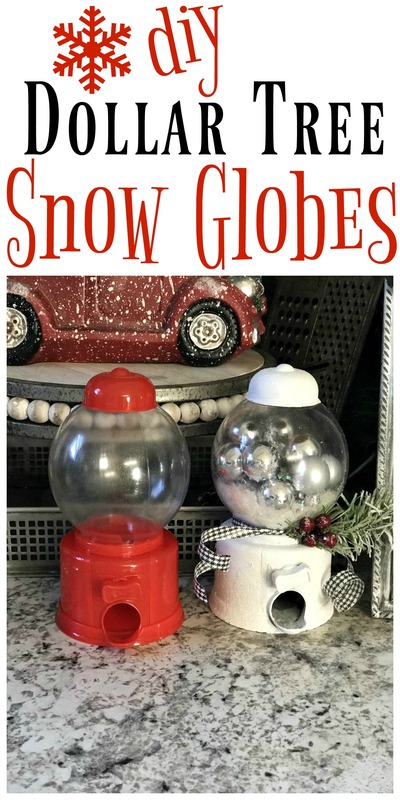 I then poured some “fake” snow into the globe and added several mini glass ornaments that I had on hand! You can get these after Christmas for dirt cheap- and for only $1.00 NOW at Walmart and places like that! For a little added touch, I took some ribbon I had on hand, along with a piece of greenery and berry and tied a the ribbon in a knot and then hot glued the greenery/berry on top. This part truly set it all apart! That is literally all! 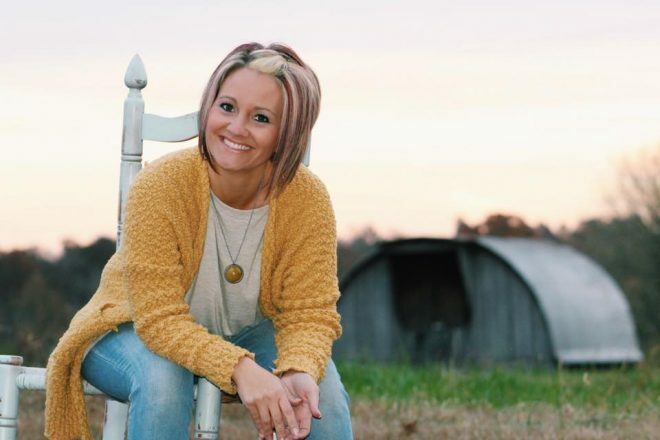 SO quick and easy and SUPER DUPER CUTE! And a little before and after! 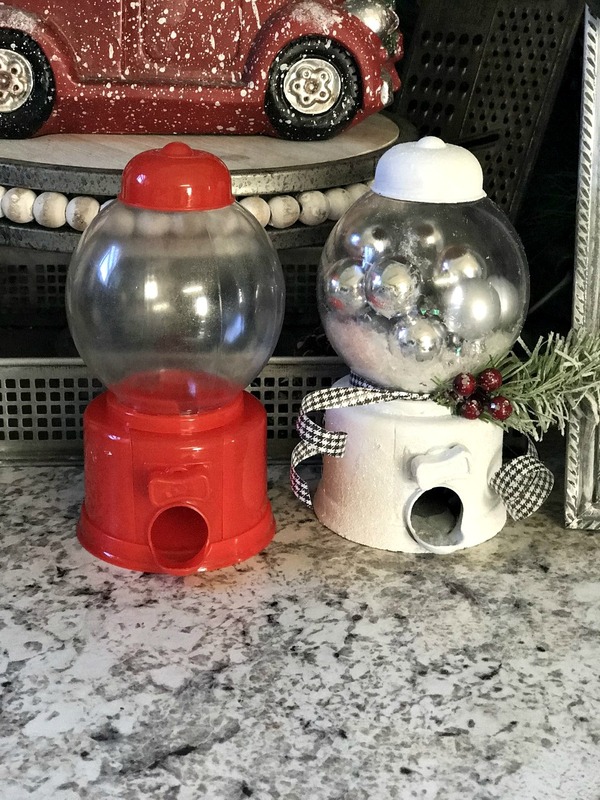 Isn’t it amazing what a little plastic gumball machine can turn into with a little imagination??? 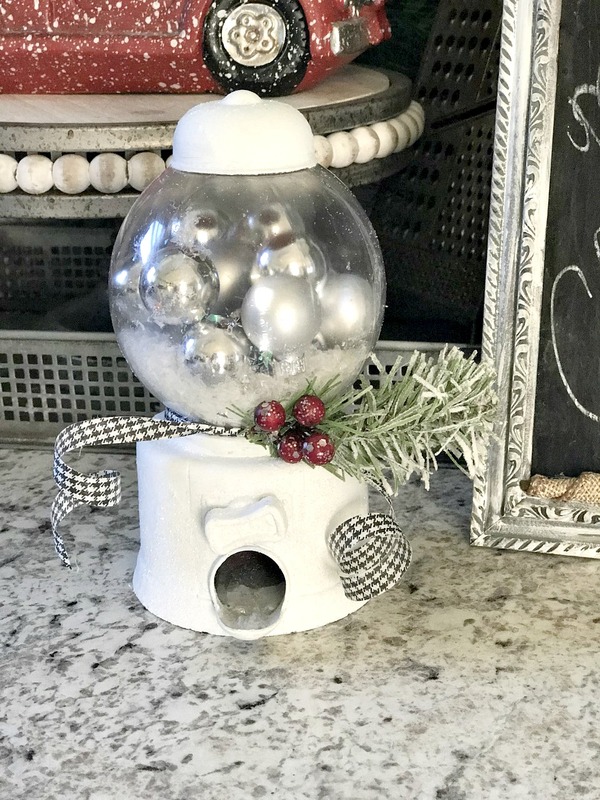 PIN THIS DIY DOLLAR TREE SNOW GLOBE FOR LATER!!! Love it & scored several at my DT. Lucky I got yellow; easier for my paint to cover. Thanks for the idea! !